This look is awesome! Simple but very chic! You certainly look amazing in this incredibly comfortable sweater. Adore the pattern of your knit and the metallic denim! Love that sweater! Definitely looks cozy. I love its subtle knit pattern. Great effortlessly chic look! Awesome outfit! Love your sweater. It really looks good & the color too. El! You look great! Beautiful! Great look and great sweater! Perfect sweater for fall. We love how you don't need $500 shoes to look good. Great outfit. You look simply cute! I love it! It is such an easy, cute look. looking so beautiful . nice outfit . fantastic pics . You look gorgeous in that sweater. I love these pics! Lovely outfit as usual! I admire your ability to make every piece piece of clothing extraordinary. 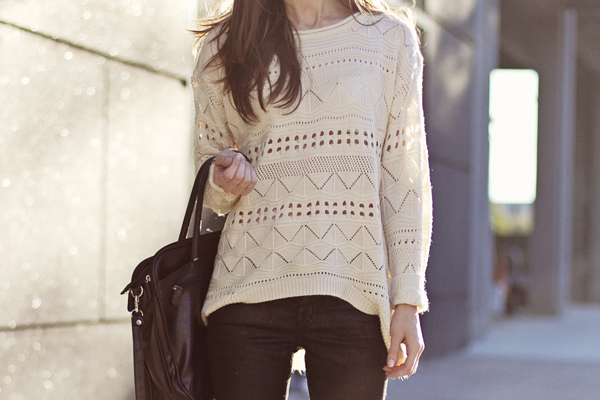 What a beautiful, comfy fall outfit! You look stunning! I was about to order this sweater from SheInside but then I read some bad reviews about them online. What was your experience ordering from SheInside? I would love to know how long shipping was, what is the quality of the sweater, etc. I'd really appreciate your reply.